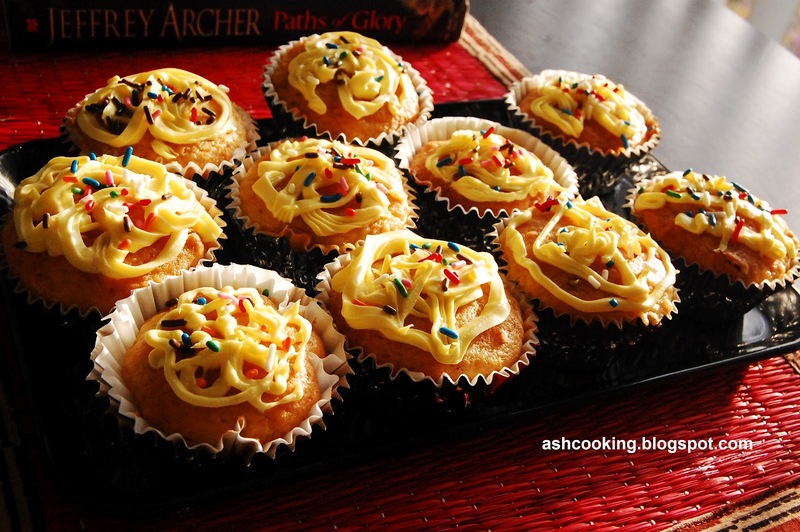 I was reading some very interesting discussion on the war waged between muffins and cupcakes. According to some, muffins with icing are called cupcakes and muffins without icing are muffins, meant for breakfast, whereas cupcakes are served in a party to celebrate something. Some opine that the terms attached with muffins and cupcakes usually derive from the quantity of flour and sugar that go into their making. Well, I don’t exactly understand the technicality of the terms but must I say, it does not matter whether you are consuming cupcakes or muffins as long as both are delightful and give pleasure to the one eating them. I absolutely adore muffins and whenever I get some spare time in hand, I set on to baking muffins. They are useful for breakfast and worth having to satisfy that untimely hunger pinch at any time of the day. Cupcakes tend to be a bit more on calorie side because of the icing, so I prepare them less at home unless of course there is a party. Ingredients (21-22 cup cakes): Cooking time: 1 hour approx. 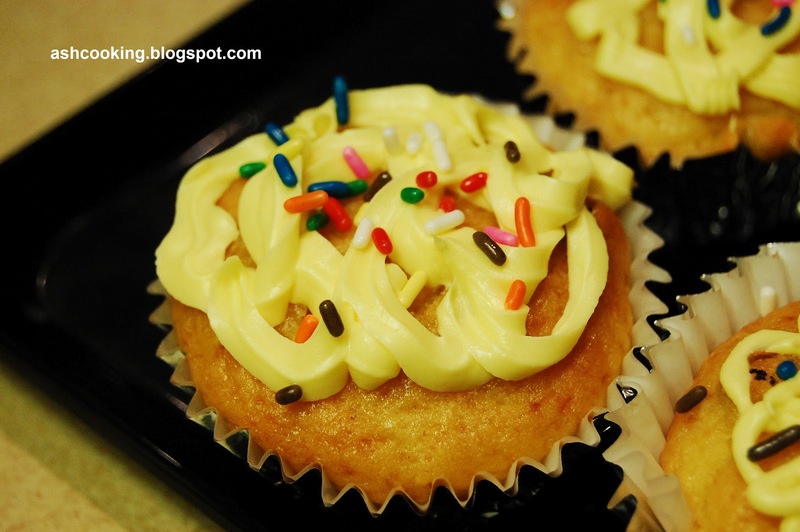 You can prepare icing on your own by whipping butter with icing sugar or else like me you can buy readymade cupcake icing easily available in the market. For my cupcakes, I used buttercup yellow icing. Note: I used salted butter. In case if you are using white butter, add 1/2 tsp of salt to balance out the sweetness. You may also add raisins, walnuts and pecan chips while baking the cup cakes to enhance the taste further. 2) Now in a mixing bowl, mix in all the ingredients together. You may use a hand blender to whip the mixture. If you have referred to my earlier posts on cakes, then you may also choose to mix dry and wet ingredients separately and later put them all together. I always go with the second option as it keeps me safe from over mixing. 3) Pre-heat an oven at 350 degree F or 180 degree C. Grease the muffin tins or put a muffin case into the muffin tins and pour spoonful of batter in each. Sprinkle raisins on top or pecan chips and use a spoon to give a mild swirl. 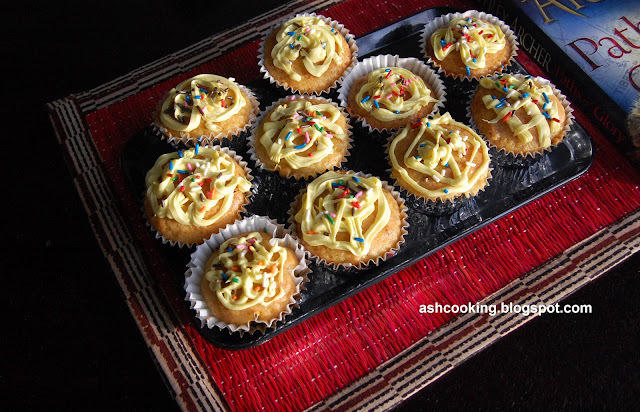 4) Bake the cupcakes for around 40-45 minutes till a toothpick inserted at the centre comes out clean. 5) Take the muffins out of the oven once they are baked and then bring them in room temperature before you set to decorate the cakes with icing.